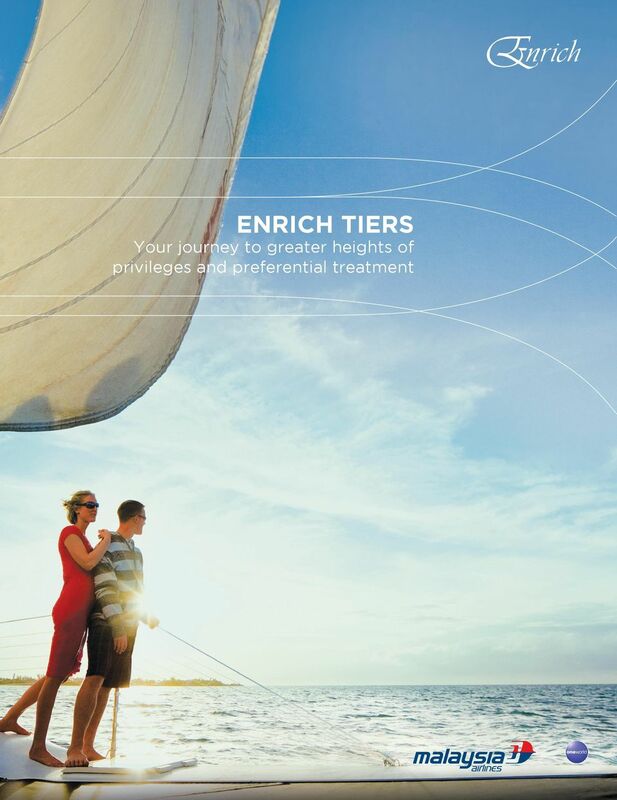 Download "ENRICH TIERS Your journey to greater heights of privileges and preferential treatment"
3 ENRICH PLATINUM In the upper echelons of luxury travel, the privileges are unsurpassed. REQUIREMENTS Qualification 100,000 Elite Miles or 130 Elite Sectors Requalification 100,000 Elite Miles or 100 Elite Sectors BENEFITS AND PRIVILEGES 1. Enrich Platinum membership for your spouse. 2. Meet & Greet and Kerbside Drop-Off Service at Kuala Lumpur International Airport (KLIA). Just book this service 24 hours before your flight, by calling us at: (within Malaysia) (outside Malaysia) 3. Malaysia Airlines Platinum Lounge access at KLIA for you and one guest travelling on any Malaysia Airlines or oneworld flight. For access to lounges for children under 12 years old and infants, please refer to malaysiaairlines.com 4. Platinum Assistance Programme for global emergency, travel, automobile, home or concierge assistance. Call anytime, from anywhere in the world. 5. Enrich Miles with no expiry date. 6. Priority on the reservation waitlist if your flight of choice is fully booked. 7. Guaranteed seat in Malaysia Airlines Economy Class if First Class and seats are fully booked, as long as your reservation is made no less than 24 hours before flight departure. 8. Telephone check-in at our dedicated 24-hour Enrich Platinum Helpline Collection of boarding pass at the check-in counter: If you have no luggage: 30 minutes before departure (for domestic flights) 40 minutes before departure (for international flights) If you have luggage: 60 minutes before departure 9. 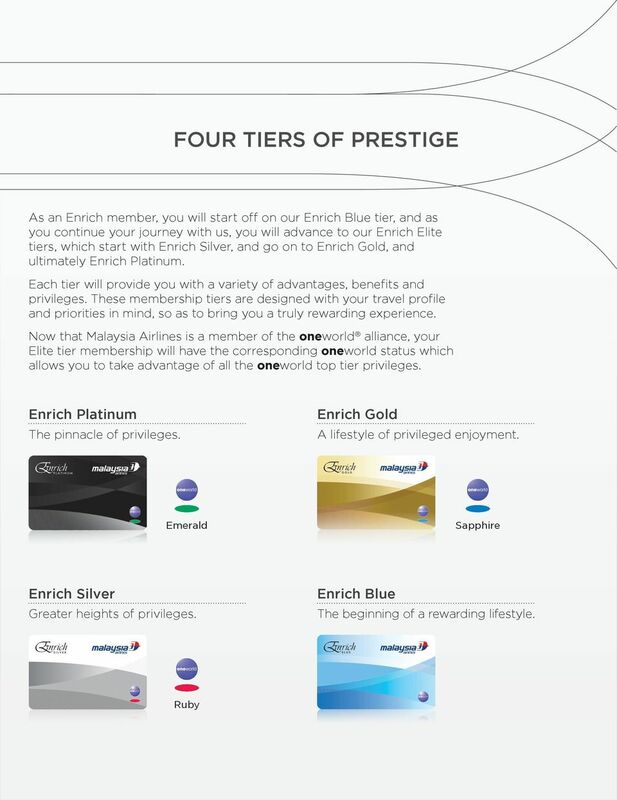 Priority check-in at the Enrich Platinum and First Class counters at KLIA, or First and counters at other airports, regardless of your class of travel. 10. Priority airport standby if your flight of choice is fully booked % extra baggage allowance on top of your travel entitlement class when you fly with Malaysia Airlines. 12. Priority baggage handling even if you are travelling on Economy Class. 13. Priority boarding at the same time as First and Business Class passengers of Malaysia Airlines, regardless of your class of travel. 14. Malaysia Airlines Golden Lounge access for you and one guest who is travelling on any Malaysia Airlines or oneworld flight. Simply register together at the lounge. For access to lounges for children under 12 years old and infants, please refer to malaysiaairlines.com 15. Access to the network of Malaysia Airlines Shared Lounges for you and one guest travelling on Malaysia Airlines or oneworld member airlines (for departures only). 16. Receive a 30% Elite Tier Bonus on your base miles whenever you fly with Malaysia Airlines. Elite Tier Bonus Miles do not count towards Elite tier status qualification. 4 ENRICH GOLD A life of enjoyment and extraordinary privileges that is fully deserved. REQUIREMENTS Qualification 50,000 Elite Miles or 50 Elite Sectors Requalification 50,000 Elite Miles or 50 Elite Sectors BENEFITS AND PRIVILEGES 1. Priority on the reservation waitlist if your flight of choice is fully booked. 2. Telephone check-in: (within Malaysia) (outside Malaysia) Collection of boarding pass at the check-in counter: If you have no luggage: 30 minutes before departure (for domestic flights) 40 minutes before departure (for international flights) If you have luggage: 60 minutes before departure 3. Priority check-in at the Enrich Gold counter at KLIA, or First and counters at other airports, regardless of your class of travel. 4. Priority airport standby if your flight of choice is fully booked % extra baggage allowance on top of your travel entitlement class when you fly with Malaysia Airlines. 6. Priority baggage handling even if you are travelling on Economy Class. 7. Priority boarding at the same time as First and Business Class passengers of Malaysia Airlines, regardless of your class of travel. 8. Access to the Malaysia Airlines Golden Lounge. Unwind and recharge at the Golden Lounge at KLIA or Malaysia Airlines Golden Lounges at other airports, regardless of your class of travel. You are welcome to bring one guest who is travelling on any Malaysia Airlines or oneworld flight. Just register together at the lounge. For access to lounges for children under 12 years old and infants, please refer to malaysiaairlines.com 9. Relax in the luxury of over 50 lounges in the network of Malaysia Airlines Shared Lounges, exclusively for you and one guest travelling on Malaysia Airlines or any oneworld member airline (for departures only). Shared lounges are lounges not operated by Malaysia Airlines. 10. 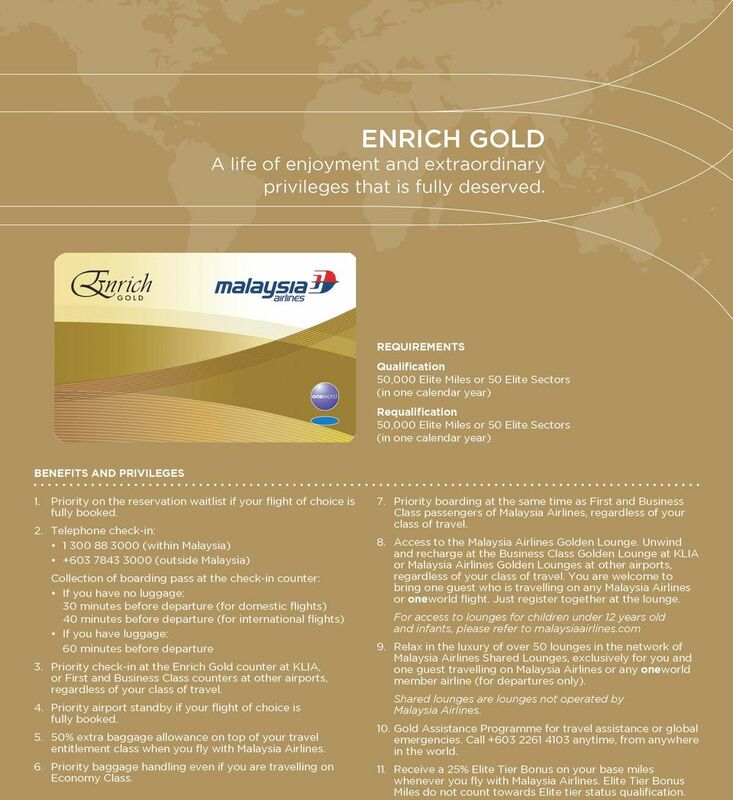 Gold Assistance Programme for travel assistance or global emergencies. Call anytime, from anywhere in the world. 11. Receive a 25% Elite Tier Bonus on your base miles whenever you fly with Malaysia Airlines. Elite Tier Bonus Miles do not count towards Elite tier status qualification. 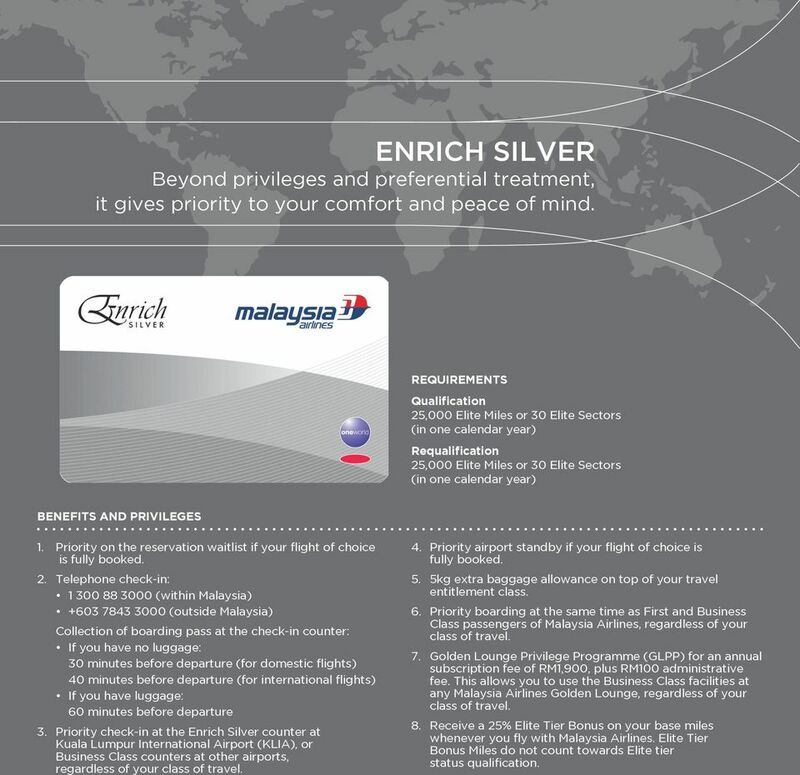 5 ENRICH SILVER Beyond privileges and preferential treatment, it gives priority to your comfort and peace of mind. REQUIREMENTS Qualification 25,000 Elite Miles or 30 Elite Sectors Requalification 25,000 Elite Miles or 30 Elite Sectors BENEFITS AND PRIVILEGES 1. Priority on the reservation waitlist if your flight of choice is fully booked. 2. Telephone check-in: (within Malaysia) (outside Malaysia) Collection of boarding pass at the check-in counter: If you have no luggage: 30 minutes before departure (for domestic flights) 40 minutes before departure (for international flights) If you have luggage: 60 minutes before departure 3. Priority check-in at the Enrich Silver counter at Kuala Lumpur International Airport (KLIA), or counters at other airports, regardless of your class of travel. 4. Priority airport standby if your flight of choice is fully booked. 5. 5kg extra baggage allowance on top of your travel entitlement class. 6. Priority boarding at the same time as First and Business Class passengers of Malaysia Airlines, regardless of your class of travel. 7. 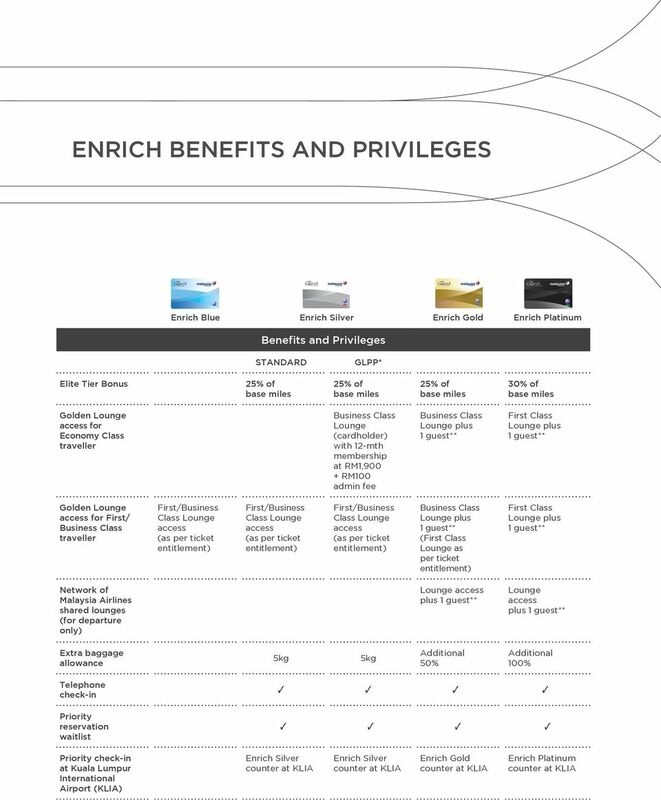 Golden Lounge Privilege Programme (GLPP) for an annual subscription fee of RM1,900, plus RM100 administrative fee. This allows you to use the facilities at any Malaysia Airlines Golden Lounge, regardless of your class of travel. 8. 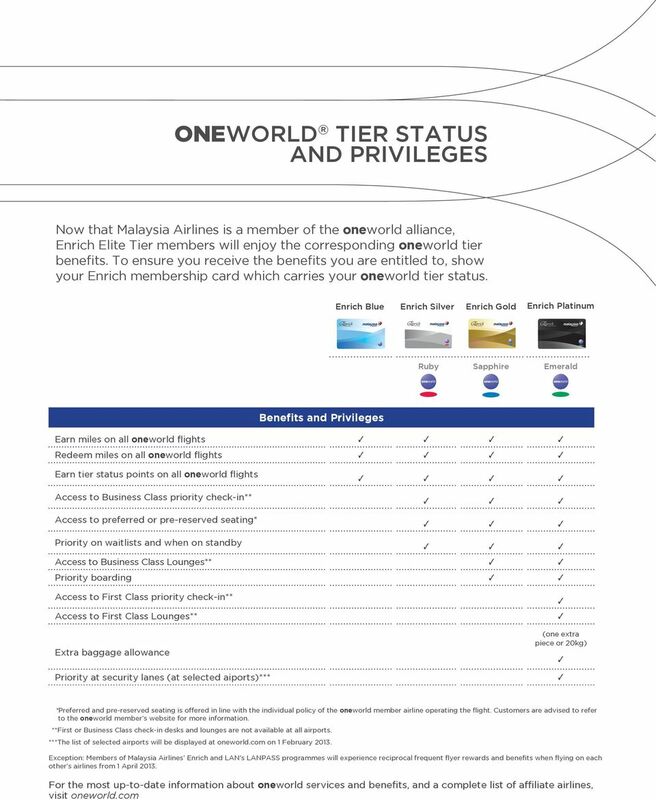 Receive a 25% Elite Tier Bonus on your base miles whenever you fly with Malaysia Airlines. Elite Tier Bonus Miles do not count towards Elite tier status qualification. 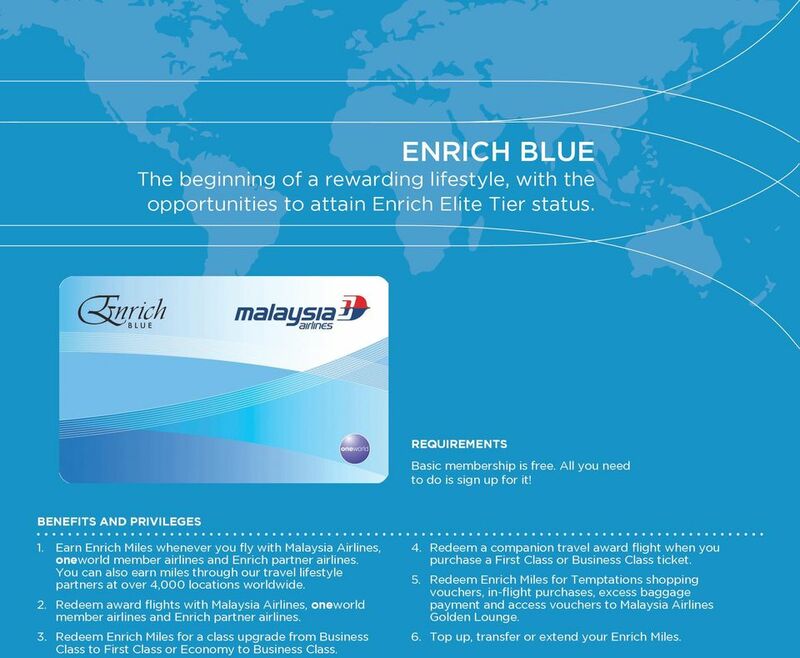 6 ENRICH BLUE The beginning of a rewarding lifestyle, with the opportunities to attain Enrich Elite Tier status. REQUIREMENTS Basic membership is free. All you need to do is sign up for it! BENEFITS AND PRIVILEGES 1. 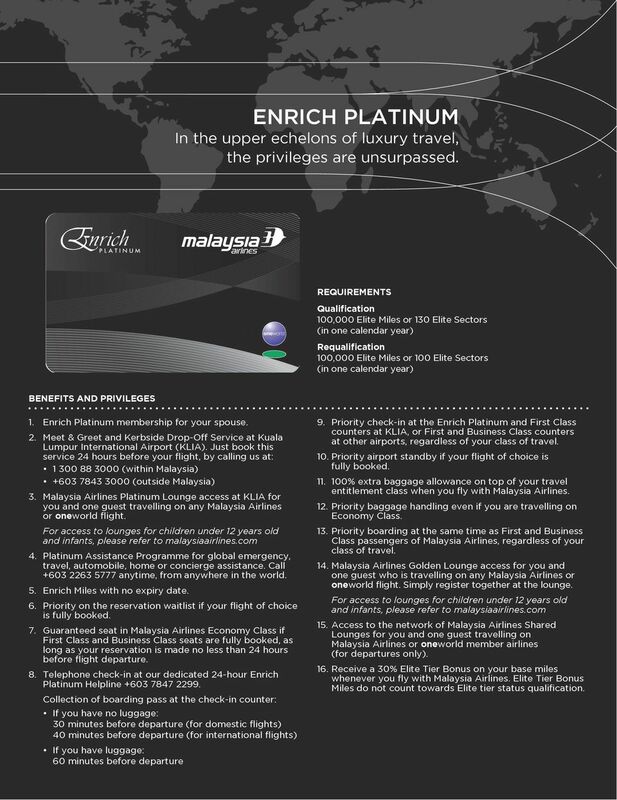 Earn Enrich Miles whenever you fly with Malaysia Airlines, oneworld member airlines and Enrich partner airlines. You can also earn miles through our travel lifestyle partners at over 4,000 locations worldwide. 2. Redeem award flights with Malaysia Airlines, oneworld member airlines and Enrich partner airlines. 3. Redeem Enrich Miles for a class upgrade from Business Class to First Class or Economy to. 4. Redeem a companion travel award flight when you purchase a First Class or ticket. 5. Redeem Enrich Miles for Temptations shopping vouchers, in-flight purchases, excess baggage payment and access vouchers to Malaysia Airlines Golden Lounge. 6. Top up, transfer or extend your Enrich Miles. LAN Airline Flight Schedule Exclusively Prepared for World Spree Traveler The scheduled departures of World Spree Tour feature flights with LAN Airline (code LA). LAN operates non-stop flights from,, to. Welcome. Index. reciprocal frequent flyer programme benefits and lounge access will be facilitated. 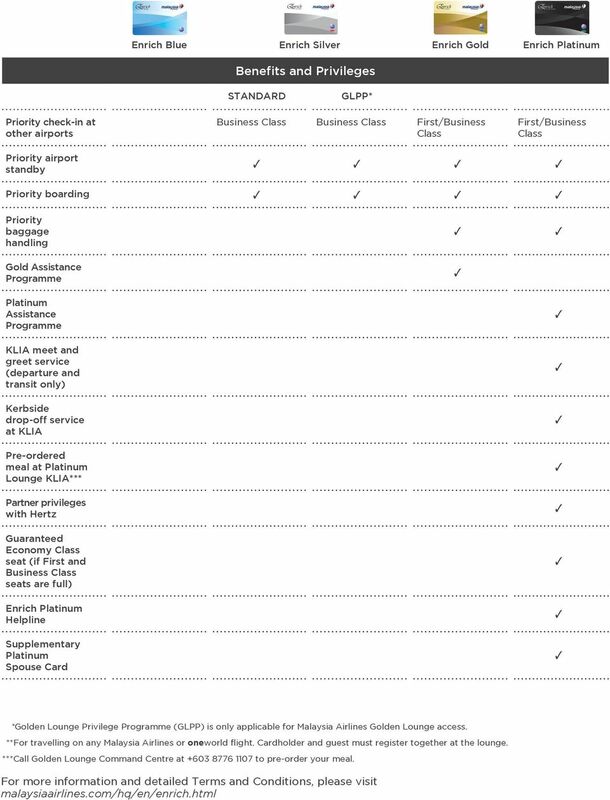 Welcome The Air New Zealand and Virgin Australia alliance sees the two airlines operating code share services on each other s flights across the Tasman and on connecting domestic services in each country. Your guide to everyday banking. Your life just became easy. Sales Manual overview Page 3. About AccesRail 9B/450 Page 3. About this Sales Manual Page 3. Michigan Flyer Product Overview Page 4. Can I change or cancel an upgrade offer once it has been submitted? Be rewarded with Crown Signature Club Program and Tier brochure WELCOME TO A WORLD OF REWARDS Be rewarded with Crown Signature Club Enjoy a truly rewarding experience with a Crown Signature Club membership.